Everyone who lives with an animal knows that they each have their own special personality. Some are serious, some are healers, some are leaders, some are followers — and everything in between. Then there are animals like Sookie — who was quirky, funny and fun loving — no matter what was happening in her life. The photo above is the photo Catie, Sookie’s person, gave me the first time we talked to Sookie. When I was getting ready to write this blog post, I asked Catie if she wanted me to use a different photo. She said, “No, this photo really shows Sookie’s character” — and so it does! Catie and I talked to Sookie regularly for five years or more. No matter what we were talking to Sookie about, even life threatening issues, Sookie always left us laughing because she never let anything get her down. I first met Catie at one of the metaphysical fairs in Colorado. Without telling me anything in advance, Catie asked what I could feel in Sookie’s body. I felt pressure in her chest, but it didn’t feel like her lungs or heart — closer to the surface than that. It felt contained — like it was encapsulated, rather than spread out and was fairly large. Catie told me that the vet had diagnosed Sookie with having a tumor in her chest that was cancerous and terminal. Catie wanted to know if Sookie was ready to cross to Spirit as the vet has suggested. Sookie told us that other than the pressure from the “tumor” she felt fine and she was NOT ready to cross to Spirit. Catie asked if Sookie wanted the “tumor” removed surgically, but Sookie didn’t want that either. She told us we should just wait and see what happened with the “tumor” and in the mean time she was going to enjoy every day of life that she had. We told her that the “tumor” might end her life early, but she still didn’t want surgery. Her attitude was amazing and she was very clear and strong about her opinion on this. Catie said she didn’t want to put Sookie through surgery if she didn’t want it, so she agreed to wait and see. We continued to check in on Sookie periodically and she continued to say she didn’t want surgery and was not ready to cross to Spirit. Catie honored her request. A few months later, Catie told me that the tumor burst on it’s own and “It was a very bloody mess.” At that point, there was no option but to do surgery. The area was heavily infected and the vet tech said she never saw a dog who was that sick get up and move so quickly after surgery. The biopsy taken during surgery showed that there had been a foreign object in Sookie’s chest but they couldn’t find it. The vet thought that the object must have left her body when the “tumor” ruptured. Through it all, Sookie was her usual upbeat, funny self, enjoying her life to the fullest. For the next few years we continued to talk to Sookie regularly about non-life threatening issues. These are some of the conversations that Catie remembers best . . .
Catie told me that Sookie always ate her breakfast quickly during the week, finishing before Catie left the house for work. Weekends were different and Sookie was content to eat later in the day and in a more leisurely manner — even though she was fed at the same time as during the week. Catie wanted to see if we could get Sookie to eat in a more leisurely way during the week, since that would mean that she’d have less time to wait before being let out when Catie came home from work. Sookie didn’t see the logic of this. She said, “I’m going to have to [go potty] whether I eat fast or slow, so it doesn’t matter when I eat.” I asked her why she ate fast during the week, but not on the weekend and she said, “If she [Catie] is in a hurry, then I’m in a hurry.” Catie confirmed that she was always in a hurry in the morning on work days, but not on the weekend, so she knew exactly what Sookie meant. Catie reported later that Sookie continued her pattern of eating fast on Catie’s work days and slower on weekends after our chat. As always, Sookie did things her way! In an effort to give Sookie something fun to do, Catie bought a “treat ball” toy. The idea is that you put a few treats/kibble pieces in the plastic ball that has a small opening that the treats to come out of. To get the treats out, the dog has to roll the ball until the treats fall out. Catie gave Sookie the treat ball and showed her how it worked. Sookie was not impressed and ignored it. Catie wanted to find out why Sookie didn’t like the treat ball. Sookie told us that she thought it was “just stupid” and “I shouldn’t have to go through all that effort to get the treats.” That was the end of the treat ball! In addition to Sookie, Catie also had a cat and after a time and got a second cat as company for the first cat. Sookie was chasing the new cat, which of course is not good. When we talked to her about this, I asked Sookie if she liked the new cat. She said, “YES! I love playing the ‘not allowed game,’ with the cat!” She showed me a picture of her chasing the new cat and Catie yelling, “you’re not allowed to chase the cat!”. To Sookie, the whole thing — the chasing and the yelling — was all fun and she called it the “not allowed game”. I explained to Sookie that it was not fun for Catie or the new cat when this happened and that Sookie was the only one who thought of it as a game. I encouraged her to find a toy when she was thinking about chasing the cat and to play with her toy instead of the cat. Sookie agreed to the plan, although she really couldn’t understand why Catie and the cat didn’t enjoy the “not allowed” game as much as she did. Catie told me Sookie didn’t chase the cat any more after that. Catie started taking Sookie with her when she went running. Sookie loved the runs and looked forward to them. But as the years went by, Catie realized that the long runs were becoming too much for Sookie after about a mile. Catie asked me to see if Sookie would be willing to slow down and just walk when she got tired. Sookie was reluctant to do this. She finally admitted to me that she didn’t want to let Catie down. I also felt Sookie was embarrassed that she couldn’t keep up as well as she used to. Catie admired Sookie’s determination but was very concerned that she’d over do it and exhaust herself. After some thought, I came up with a different way to go at the issue. With Catie’s permission, I told Sookie that maybe the reason Catie wanted Sookie to walk more was because Catie actually needed to slow down and take it easier on the runs. Sookie agreed that since it would be better for Catie to walk more, she would walk when she was tired . . . and that’s exactly what she did from then on! Sookie’s started having health issues again a few years after our first conversation and Catie again asked me to check on her. I felt pressure in Sookie’s upper abdomen. Catie told me that Sookie had been diagnosed with an enlarged spleen — which explained the pressure I felt. Sookie was slowing down but was still enjoying her life. The vet felt things were stable and they continued to monitor Snookie. Sookie had her surgery in March. The vet removed a 7.5 pound tumor from her spleen. Catie reported that after Sookie recovered from the surgery, “she ran around like a puppy!” Catie was so happy that Sookie was back to normal and Sookie was thrilled . . . but sadly, it didn’t last. After a few weeks, Sookie’s health started to decline very quickly. The vet suggested steroids to help prolong her life, but when we offered this as an option to Sookie, she didn’t want to take them. She said she was very glad to have had a few more weeks of feeling good, but now she was ready to cross to Spirit. She felt that those weeks of feeling good were a gift — but now it was time to go. Catie asked if Sookie could hold on for a few more days — Catie had to work and Catie wanted to spend as much time with her as possible before Sookie crossed over. Sookie said that she knew that Catie’s job was important, that it “put food in my bowl” [we’d talked about that previously] and she was content to have a few more days to be with Catie. I explained to Sookie what would happen when Catie took her to the vet so they could help her cross to Spirit. Sookie showed me that she wanted to lie on the floor and have Catie “spoon” with her and wanted Catie’s hands on Sookie’s chest, over her heart, while she crossed to Spirit. Catie and Sookie enjoyed their last few days together on earth. On the appointed day, Catie took Sookie to the vet’s office and did exactly as Sookie requested. Sookie crossed to Spirit peacefully and Catie sent her to Spirit with all the love in her heart. A few months later we talked to Sookie in Spirit. She had a lot to say! She showed herself to me as looking about 3-4 years old, coat shiny and glossy and in perfect health. The most significant thing, however, was the big goofy smile on her face! Catie laughed when I told her that and said, “That is so Sookie!” Sookie showed me that she was running, jumping and playing in Spirit. She showed me she had lots of animal friends in Spirit and that she’d even made friends with cats! Catie said that, based on her behavior with Catie’s cats when Sookie was alive, that was hard to believe. I told that to Sookie and she said, “I know — I can hardly believe it myself!” Sookie then got serious and said that she was grateful that Catie didn’t let her suffer at the end and that she didn’t think anyone else would have tried so hard to keep her healthy and alive for so long. Now that she was in Spirit, Sookie said that she would be helping Catie with strengthening her intuition when Catie was sleeping. The picture Sookie showed me of how she was going to do this made me laugh out loud . . . Sookie showed me Catie lying in her bed and Sookie standing over her, with Sookie’s nose pointing at Catie’s nose and Catie lying between Sookie’s legs. Sookie was not a small dog — she’s 100 pounds of dog that looks like a wolf. When I described this to Catie, she also laughed out loud and said it would be SO like Sookie to come up with that! We both thought it might be tough for Catie to sleep if Sookie was standing over her like that, so I suggested it might work better if Sookie lay down next to Catie instead. Sookie still thought standing was better, but agreed to the plan. Catie told me that when she hears wind chimes when there is no wind, she knows that Sookie is visiting with her. We’ve talked to Sookie a several times since she crossed over. Each time Catie wanted to know what Sookie was doing. The first time we talked to Sookie in Spirit, she told us that she was “teaching other dogs how to be funny.” This wasn’t an official “job” — it was just what Sookie was choosing to do — and she was enjoying every minute of it. Later Sookie told us this was her official “job” in Spirit and she showed me that she had a pack of dogs around her that she was teaching “dog jokes” — things that the dogs could do to make their people laugh. Since Sookie had such a great sense of fun, this was the perfect job for her! Sookie also showed me that she’d found a fantastic new game to play. She was stealing wing feathers off of the Angels! It was clear from what she showed me that the Angels were totally in on the game — that they saved feathers and tucked them in so that Sookie could steal them, then acted shocked when she stole the feathers — which filled Sookie with delight! Catie said it was SO like Sookie to do this. Another time, Catie told Sookie that all the vets and the vet office staff always talk about Sookie when Catie visited the office with her cats. Catie said that the office staff people were very sad that Sookie didn’t live longer after surgery . . . but Sookie was just thrilled that people besides Catie still remembered her! Her comment was, “I’m famous!” — which made Catie laugh — she thought this was adorable. Catie had this to add . . . “Sookie was a larger than life dog. 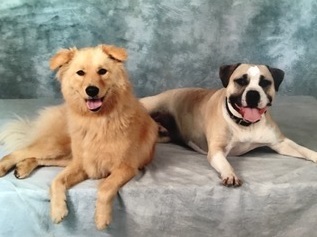 People were constantly asking me if Sookie was part wolf, but she was just my large, lovable, goofy, furry soul sister. Her amber eyes could scare away a predator or melt your heart with love. I always admired her spirit of longing to run free and enjoy every moment. Knowing that we will have a new generation of goofy dogs coming back to us on Earth because of Sookie’s work in heaven makes me laugh each time I think about it. She will always be in my heart and a part of me. I have a feeling that she is enjoying this blog post more than me, since it gives her another chance to be famous! When I first met Sky at a psychic fair I knew she was the real deal from the start. When Sky spoke to Sookie, she told me the very unique way my roommate greeted Sookie each day. It was something a stranger would never be able to guess. Over the course of the years even more proof of her authenticity and compassion showed through the communication sessions I did with Sky. When Sookie got sick it was devastating to me. I wanted to do everything I could for her. But allowing Sookie to decide for herself what she wanted to do in her final days with me is a priceless gift I will forever cherish. It helped me deal with the mourning in a positive way. I am absolutely grateful for all Sky has done for me over the years, and I know my furry ones are grateful as well. Any person or animal that has the opportunity to work with Sky is truly blessed.” — Catie G., CO.
Jen fell in love with Ben, a very handsome Oldenburg horse. Ben had a great personality and Jen bought him with the intent that he would be her “safe” dressage horse. Ben had been trained in dressage, so Jen didn’t think she’d be starting from scratch. Jen knew that retraining would be needed to develop his muscles correctly, but she was willing to put in the time. Sometimes what you see is what you get and other times — not so much. After Jen purchased Ben in July 2017, Ben had a long trailer ride from a southern state, where he had been living, to a state far to the north, where Jen lived. Jen reported that Ben was frantic when he got off the trailer — very stressed and upset. However, he settled in quickly at Jen’s trainer’s barn. But Jen couldn’t give up on Ben. Jen and her trainer felt that Ben’s reaction the day he dumped Jen was probably related to emotional overload and possibly saddle fit issues. The change of ownership, the trailer ride, being in a new place, all seemed too much for him. After being sure the saddle fit well, Jen’s trainer rode Ben and Jen sat on the sidelines and observed. Ben was doing OK under saddle for a few weeks, then began to slowly deteriorate. It was clear that Ben was becoming more and more uncomfortable under saddle — and more and more unwilling to be ridden. By October, Ben was almost unrideable, even by Jen’s trainer. While Ben was dangerous under saddle, he was sweet, loving and adorable when Jen wasn’t riding him. She just couldn’t give up on him — she couldn’t stop hoping that the sweet horse Ben was on the ground could find a way to get past his uncooperative behavior under-saddle. Jen called in her vet to examine Ben. X-rays showed nothing helpful. In December movement analysis was done and intensive e-stimulation treatments were done for Ben’s back, which they’d finally determined was the source of the problem. Jen and her trainer also did long lining and ground work with Ben for months to encourage him to bond with them and to help Ben heal physically and emotionally. Finally in April, Jen’s trainer felt it was time to try Ben under saddle again. The trainer would ride and Jen would watch. In Jen’s words, “we had limited success.” Jen felt that they were missing something — something that would help Ben move forward. She didn’t know what else to do, so she contacted me about animal communication, hoping that would give her the answers that were needed. We had our first communication session with Ben in Mid-April. Initially, Jen wanted to know how Ben was feeling, physically and emotionally. It was clear to Jen that something had gone terribly wrong on the trailer ride from Florida, but she didn’t know what. When I asked Ben about this, I was hit with an intense flood of feelings/images — panic, fear, confusion and confusing images that were terrifying to Ben. I couldn’t get a clear picture of what happened, but to Ben it was very, very bad. My impression was that whatever happened, tweaked something in Ben’s back that ended up causing him a great deal of pain. The pain was not an issue most of the time — only under saddle, which is why his behavior deteriorated under saddle. This made sense to Jen because the area in his back that Ben showed me was painful was the area where he’d been receiving e-stimulation treatments from the vet. Ben said/showed me that his back was better, but his muscles were still very tight and would spasm at times. The pressure of the saddle made everything worse. But it was improving, slowly, he felt. For the first session, all we were able to do was allow Ben to express and release his feelings, but each session he was able to listen and let go more of the emotional energy. Ben had a lot to say and express. He felt no one had been listening to him for a very long time. This was nothing personal to Jen or her trainer — the “not listening” had started long before Ben came to Jen. Jen was concerned that Ben wasn’t happy with her and didn’t actually like her. Ben was shocked that she would think this. He showed me that he was very affectionate with her when Jen was on the ground. Jen confirmed that this was true — “But why is he so different under saddle?” Ben showed me that when he was in pain or frustrated, he had to take care of himself “because no one else would.” He did not trust his riders to look out for his welfare because no one had done so in the past. Jen asked about his previous riders. He showed me that previous riders “forced” him into the correct body/neck position — know as being “in frame” — but he showed me that they did not bother to fully develop his muscles so he could hold the correct position comfortably. Ben knew that his previous riders would not take no for an answer, so he complied to the best of his ability. But by the time he got to Jen, he had had enough — he was taking care of himself, since the humans weren’t going to take care of him. Most horses do not want to behave badly or hurt their riders. But when no one listens, when the rider doesn’t allow the horse to express himself or doesn’t listen when the horse says there is a problem — some horses feel they have no choice but to escalate their level of complaint. Unfortunately, often if a horse feels no one listens, his first reaction isn’t saying, “Hey, there is a problem here”. Instead they go right to the loudest way to complain. Because no one listened when they complained quietly, they feel the only option is to “shout”. This can mean bucking or even rearing about the smallest problem — which to the human looks like it’s happening for no reason at all. Ben was not a bad horse — he was a very good, kind horse who no one listened to. But that was all going to change! When we talked to Ben the second time, he had opened up enough emotionally that he could listen and hear. I told Ben that we understood his frustration about not being heard. I assured him — with Jen agreement — that both Jen and her trainer would listen to him. I told Ben that it was very important for him to really know and believe that Jen and her trainer would listen to him. They would never ask him to do more than he was capable of doing. I assured Ben that they would work with him to build up his muscles so he would be strong and beautiful (which was something he wanted) and that Jen would continue to take care of his back issues to be sure he was comfortable. I told Ben that his part of the partnership would be to think before he acted. I told him that when something was uncomfortable, he needed to let Jen’s trainer know. He thought about this and suggested that he could shake his head if something was too hard or he was uncomfortable. This was an acceptable signal and Jen said she would let the trainer know — she promised the trainer would listen. Ben said / showed me that if he shook his head it meant that he needed to stop what he was doing or that he was really having problems. He said he was willing to try communicating this way. I again promised him that Jen’s trainer would listen. The following month, Jen told me that her trainer had been skeptical that Ben would actually give her the head shaking signal if there was a problem. When he actually did it during the trainer’s next ride, the trainer was pleasantly surprised and stopped as Ben had requested so he could regroup. Ben shook his head several times on each ride, but recovered more quickly each time — and as time went on, did less and less head shaking! Jen reported that both she and her trainer are very intentional about everything they did with Ben on the ground and under saddle. This has helped Ben relax more and become more confident in himself, in Jen and her trainer. In communication sessions, we reminded Ben that the trainer would only ask Ben to do things she knew that he could do and remind him that he could shake his head if needed. After a few months of communication sessions, it was evident that Ben had gained confidence and was being cooperative and willing when riden by Jen’s trainer. Now it was time for Jen to deal with her own challenge — her own confidence in riding Ben. Jen had been sitting on the sidelines watching her trainer ride Ben since Ben bucked her off the first week he was with her. Jen was able to see the improvement in Ben and the trainer felt it was time for Jen to ride Ben again. If you’ve never been bucked off a horse, it may be hard to understand the challenge in this. I know from personal experience how hard that is. But Ben was ready and wanted her to try. Each lesson, Jen and the trainer would work Ben from the ground, then the trainer would ride him. Jen started sitting on Ben, walking him for a few minutes after the trainer finished. When I asked Ben about this, he said that Jen was very tentative and “blocked” — in other words, her fear was keeping her from connecting to Ben. He found this very irritating. I told him about Jen’s fear and that he needed to help her with it by showing her that he knew what he was doing. He said he needed her to help him too, but he would try. The great thing was that Ben really wanted this to work! Soon things were going better and Jen was able to walk and trot Ben. She was still nervous, but at least they were working together. In August, we talked to Ben again and this time her trainer listened in on the session. Jen reported that Ben was really doing well with his dressage work. I asked him how he was feeling. He showed me that he felt fit, strong and beautiful — “like a real horse!” I asked about how things were going with Jen riding him. He showed me that she had been leaning forward, which unbalanced both him and her and made his job more difficult. Jen’s trainer confirmed that Jen was doing this. Ben said he was really being good and wasn’t doing anything wrong, even though Jen was leaning forward. The trainer confirmed this too. Later that day I got an email from Jen. She wrote, “After we talked to you, Ben and I cantered today for the first time in over a year! I put my big girl pants on and kept balanced without leaning forward. Ben met me half way and did his part. It was super exciting!” What a victory for both Ben and Jen! We’ve continued to talk to Ben once a month or so. New issues have come up, but each time we talk our way through it. Jen believed in Ben and didn’t give up on him and Ben continues to try to be a good partner for her. “After coming off Ben the first week. I shut down. I had to do a lot of work on myself to deal with that fear. Then it took having Sky open up the lines of communication with Ben to build trust under saddle for both me and Ben. We’ve still got a long road to go, but there is light at the end of the tunnel. With ongoing training, rehab treatments and communication with Sky, I’m hopeful that Ben and I will be reaching out potential as a team.” — Jen, USA. I met Janet many years ago at a “Hags and Nags” get together. The group was for women who rode horses — and they definitely did not take themselves seriously! I had been invited to the gathering to do animal communication. I talked to many of the women and their animals, including Janet. She was fascinated by the communication session I did for her horse and when she found out that I also did massage for horses, she couldn’t wait to schedule an appointment with me to massage her horse. I did equine massage for Janet’s horse, an off the track Thoroughbred named Amtrack, for the next 15 years or so. We did animal communication with Amtrack too and we also talked to Janet’s other animals — dogs, cats and her bird, Pasquale, a Green Cheeked Sun Conure — many times over the years. Green Cheeked Sun Conures are beautiful birds and Pasquale was no exception. But Pasquale was a one woman bird — and that woman was Janet! Janet told me that when she had her own business with a shop location, she would bring Pasquale to work. He would happily sit on her shoulder, climb on her and generally supervise. But if anyone came into the shop, Janet had to put Pasquale back in his cage because he would be come very protective of her. When I moved from NJ to CO, Janet was kind enough to let me stay at their house so I could see my clients that were located north of her more easily. As a result we got to spend a lot of time together and we became close friends. Janet would often let Pasquale out of his cage when we sat at the kitchen table talking. Janet always warned me not to touch Pasquale and to keep my hands/arms out of his reach because he was likely to bite. I followed her rules with Pasquale to the letter and was very respectful of his space. It was interesting to see an animal that only weighed about 4 oz. so clearly dominate the space he was in — and his personal space was very large for his size! Despite being as respectful as possible, I always felt that Pasquale was giving me “the stink eye” and daring me to challenge him. Needless to say, I never did! Janet developed cancer and gradually had to decrease her activity level and give up riding — but she still wanted Amtrack to have his massages. I continued to stay with her when I was in NJ during this time, watching TV and chatting with Janet (because that was all she had the strength for as the disease progressed) and giving her what emotional support I could. Janet’s body may have been weak, but her spirit was strong and she fought her disease process as hard as she could with a positive attitude. Pasquale, whose cage was in the kitchen, was witness to these ongoing visits with Janet and our close friendship. The last weekend I spent with Janet, she was very weak but funny, positive and cheerful as ever. When I got back to their house after a day of massaging horses, I found Janet sitting on the couch with Pasquale, who was having a wonderful time climbing around on Janet. I offered to sit on the other couch, so I didn’t bother Pasquale, but Janet said she thought it would be OK for me to sit with them — so I did. After I got settled, Pasquale walked across the cushions toward me. His energy was different from before — he seems to be friendly and interested, rather than protective and threatening. Initially, Janet moved Pasquale away from me several times, but he was persistent in wanting to come near me. I suggest that Janet just let him come to me if he wanted. I promised to keep my fingers out of his way — but I really didn’t feel like he would try to bite. It was at that point that what felt to me like a miracle happened. Pasquale walked across the couch, pulled himself up on my leg by grabbing my jeans with his beak and feet and started walking down my leg to my fuzzy slippers! He then cuddled himself up on my slippers and looked like he was napping. He snuggled there for about 5 minutes. Then he walked back down my leg to my lap and started rubbing against the back of my hand — clearly he wanted some pets! I stuck out a finger and he rubbed his head against my finger and then let me pet him. I had never petted a bird before — it was a magical feeling having this tiny feather being trust me enough to let me pet him! As I petted Pasquale, he closed his eyes in pleasure. I wasn’t sure which one of us was enjoying the petting more. When he had enough pets, he climbed around on me for a while, got some more pets — then gently nipped my finger, but did not bite hard. Janet said that meant that he was tired and wanted to go back to his cage, so she put him back in his cage. Both of us were a bit stunned with Pasquale’s display of trust and affection — for my part, I was speechless! I have been given many gifts by animals over the years and the gift of trust that Pasquale gave me that day is one I will always treasure. Not long after that Janet lost her battle with cancer. It was a very, very sad day for me and everyone who knew her. I was able to go to the gathering that Janet’s family organized in her honor. The house was full of people — she touched so many lives! The occasion was sad, but it was also a celebration of the light, positivity and laughter that was Janet. At one point, I was standing in the kitchen alone and felt that Pasquale’s energy was focused on me. When I turned to look, Pasquale was indeed staring at me intently. Normally I don’t talk to people’s animals without permission, but I felt strongly that Janet would want me to talk to Pasquale, so I did. When I connected to Pasquale, he became very still and continued to stare at me. He seemed to be worried and concerned. The first thing Pasquale said was, “Do you know she [meaning Janet] is in Spirit?” I assured him that I did. He told me that Janet had visited him and told him she was fine and that he would be OK. He showed me that Janet looked beautiful — young, healthy and happy when she visited him from Spirit. He wanted to know what all the people were doing at the house. I told hm that they were all there to honor Janet’s memory and share the connection that they had with her. I felt Pasquale was very pleased that so many people would do that. He then said, “What is going to happen to me?” I assured Pasquale that Janet’s husband would find a good home for him. He said, “Can’t I come home with you?” This was completely unexpected and my heart hurt when I heard it. The feeling I got from Pasquale was that he wanted to be with someone who would understand him. Feeling Pasquale’s sadness at loosing Janet and not knowing who would care for him brought tears to my eyes. With regret, I told Pasquale that, much as I would love to take him home, it was not going to be possible. Pasquale said he understood and accepted my decision. I assured him that Janet’s husband would take very good care of Pasquale until he could find a very nice person for him to live with who would take care of him, love him and respect him. Pasquale cheered up a bit at that point and said he trusted Janet’s husband would do that — for Janet and for him. I thanked him for honoring me with his desire to come home with me and thanked him for the trust he showed in me. When I disconnected from Pasquale, he stopped staring at me and went about his business in his cage. After things had settled for Janet’s family, her husband was able to find a loving, forever home for both Janet’s elderly horse, Amtrack and for Pasquale. I will always hold my dear friend Janet in my heart and will always be grateful for the time I spent with her and her beloved animals — and for the gift of trust that Pasquale gave me. There are few things that are more frustrating than trying to get a message across to someone who isn’t listening. If the message is that something really hurts and no one listens it’s even worse. What would you, as a person, do? Talk louder, try to get the person to pay attention and maybe even yell? Animals are often faced with that kind of situation and for them, “yelling” may take the form of behavior that can be dangerous to humans. Buster is an adorable quarter horse pony that was saved from the kill pens at a horse auction in a western state in 2015 by staff from an equine rescue. He was emaciated and needed 3 months of rehabilitation before he became healthy enough to be adopted. Buster was adopted by a family as a children’s riding horse, but after only 6 months, he was returned to the rescue because he had started bucking under saddle. Sadly, Buster’s bucking behavior returned. He was adjusted by a chiropractor and the bucking behavior stopped, but only for a short while. Very soon he became “ring sour” [not wanting to enter the riding ring] and would start bucking as soon as he got in the ring. Buster was again returned to the rescue, having lived with his second family only 10 months. That’s when Buster met Kelly. Kelly is one of four people who evaluate and train horses that come to the rescue in the hope that the horses can be rehabilitated and go to new homes. The rescue works with horses with all kinds of issues and have had good success with re-homing them. Kelly found Buster to be very sweet and friendly. She knew that if they could resolve the bucking issue, he would again be a great children’s horse. Kelly and the other trainers worked with Buster for three weeks, but Buster continued to have problems. Kelly and the rest of the trainers had no idea what to try next to help Buster. They needed to find a way to get Buster to stop bucking or there was a real chance that Buster would be put down because he was too dangerous. Then Kelly remembered that I’d talked her beloved horse Calliope in 2012, when Calliope was nearing the end of her life. Kelly thought that if we could talk to Buster and figure out why he was bucking, maybe we could figure out a way to help him. Kelly talked to the staff at the rescue about scheduling a communication session for Buster and they agreed to try it — they didn’t know what else to do to help him. As soon as I connected to Buster, I felt that he was very, very sad. He said he felt that he was “no good — but I want to be good!” The feeling I got from him was that people kept discarding him, giving up on him, like he was trash. He said he loved people, especially children and wanted to be a good horse for children again. I assured Buster that he WAS a good horse and always had been. I told him it was not his fault that people didn’t understand what he was trying to tell them. I told Buster that we wanted to try to figure out how to help him so he could find a new family and children who would love him and that he could love. I could feel Buster perk up — he was more than happy to talk, now that someone would listen! My feeling was that the bucking was related to a physical issue, so I asked Buster how his body felt. He showed me that his back hurt — and it hurt even worse under saddle. He showed me that sometimes his back was fine, even under saddle, but other times it would start to hurt and then get really painful, especially when he was being ridden. He said, “I try to warn the rider that it hurts, but they don’t listen to me.” He showed me that if they didn’t get off and the pain got really bad, “I have to make them stop!” That’s when he would buck. Kelly wanted to see if the type of saddle Buster was ridden in was a factor in causing him pain. When I asked Buster about different types of saddles (by showing him mental pictures), he was very clear about what he liked and what he didn’t. Buster showed me that large western saddles with long skirts that extended too far toward his hips/lower back were very uncomfortable. He showed me that the back part of the saddle and the long part of the skirt pressed against a spot in his lower back that could become very painful with the pressure. When I checked that part of his spine, it felt like he had a physical issue with that part of the bones of his spine. He showed me that he’d been ridden at some point in a western saddle that did not fit well and put pressure on both his withers area and lower back. Buster was concerned that whoever rode him should be sure that the saddle was back far enough so that his shoulder could move freely — previously, he’d had the experience of saddle that sat too far forward and impinged on both his withers and shoulders. He showed me that who ever saddled him shouldn’t throw the saddle on so it dropped hard on his back — that really hurt! Next we asked about what type of saddles would feel good to Buster. He showed me that he was comfortable in English saddles and shorter western saddles with short skirts. Kelly confirmed that Buster had been ridden in both of these types of saddles at the rescue and that he did well with both. Buster showed me that he liked more padding under the saddle and that it was important that the saddle fit correctly to prevent pressure on his back. We asked if there was anything else that the people at the rescue needed to know about his body so he could be more comfortable. Buster showed me that he wanted people to be careful when they brushed his back, because of the spinal issue. He showed me that he liked a soft brush on his back, not a hard or spikey brush. When I looked through Buster’s body, I also felt that his muscles were tight in the withers area and back. I suggested that he could uses chiropractic and massage, possibly acupuncture. Kelly said he’d had chiropractic already, but she would pass on the suggestion that he get a few more session of chiropractic and add massage and possibly acupuncture too. I asked Buster if there was anything about his under saddle work that made him more uncomfortable. He showed me that he didn’t like doing lots of circles or making tight turns, which made sense due to his back issue since he would need to do more bending for those exercises — and for the gymkhanas. Since we couldn’t completely resolve his back issues, I asked Buster if he could show us how he would tell someone that his back is bothering him. I told him that we would be sure to tell the people who rode him what to watch for, so he could tell them quietly, rather than loudly, by bucking. Buster was thrilled that people would finally listen to him — he didn’t like to buck! Buster showed me that he would put his ears back, he would crinkle up his nose/upper lip and would look back at the person riding him. He said that if he did that under saddle, the rider should “GET OFF!” He said that he wanted to be a good riding horse, but some days he really hurt, so the people should watch for those signs when they were brushing/saddling him too. Kelly confirmed that she would pass everything Buster had told us on to the folks at the rescue, as well as to Buster’s new family if they could re-home him. Kelly was very committed to making this work for Buster. I told Buster that everyone who worked with him would know all the things he’d told us and that they would all do their best to listen and help him. Buster was happy, relieved and hopeful that things could be better for him — and so grateful that someone finally listened! About a month later, I heard from Kelly again. She said she had shared everything that Buster told us with the staff at the rescue. Kelly said that the staff was very receptive to the information and wanted to do whatever they could to help Buster. It was a relief for the staff to finally understand the cause of Buster’s bucking behavior! Buster got two more sessions of chiropractic and massage therapy and he was put on an anti-inflammatory medication by the vet. Buster was ridden in a round skirt western barrel saddle (which didn’t interfere with his lower back/hips) and an English saddle. He worked happily and without discomfort in both and never flattened his ears once! Buster was adopted by a family a few weeks after we talked to him. The family was given all the notes from our chat with Buster, so they would know what to watch for, what worked best for Buster and how to care for his back. The family was very happy to adopt Buster and was willing to continue the therapies as needed — and, most importantly, to listen if Buster said he was hurting! Kelly and the rest of the staff at the rescue were thrilled to have such a happy new start for Buster as a trail and pleasure horse for the family’s children. They are hopeful that Buster will have finally found his forever home with people who understand his needs. “Thanks to Sky, Buster can be a safe pony, free of discomfort. He is another wonderful pony saved from an uncertain future. All of us at the rescue wish him a long, happy life with children to love again!” — Kelly H.
Imagine starting your life basically alone and helpless. This is the fate of feral or abandoned animals everywhere. Now imagine, at the age of four months, experiencing physical trauma so severe that both your hind legs were severely damaged. That was how Roadie, a beautiful long haired kitten, started his life. and he was able to receive the medical care he so desperately needed. However, despite the efforts of the medical team, Roadie’s right hind leg needed to be amputated and his left hind leg was bandaged and splinted so it would have time to heal. This is when Kathleen came into Roadie’s life. Kathleen had fostered several neonatal litters of cats (aged 8 weeks old or less) during the summer for APA!. In October, she found out that Roadie’s foster person needed someone to babysit him while she traveled at the end of October. Kathleen was happy to volunteer to take Roadie into her home temporarily. By then, Roadie’s amputation was completely healed and the bandages were off his left hind leg. As soon as Kathleen met Roadie, she was captivated! Kathleen kept telling herself that she would only keep Roadie temporarily. She kept in contact with Roadie foster person while she was away, sending photos and emails about how Roadie was doing. Even though Roadie was only with Kathleen for six short days, it was clear to Roadie’s foster person that Kathleen had fallen in love with Roadie. When his foster person suggested that Kathleen take over as Roadie’s foster person, Kathleen jumped at the chance to be Roadie’s official foster. Kathleen’s only concern was her 13 year old cat Tex, who she’d adopted in January of that year. Tex and three other cats had been taken to APA! in December when their person had crossed to Spirit. Tex had been despondent when Kathleen first met him, but on the second visit, purred when Kathleen petted him. Kathleen felt/saw something in Tex and knew he was the cat for her. As soon as she got him home, Tex blossomed and became the wonderful, loving cat that he truly was. Kathleen has a very special bond with Tex — and she wanted to be sure it was OK with Tex to have Roadie stay with them. Kathleen contacted me in mid-November to talk to Roadie and Tex. Kathleen asked that we talk to Tex first, since his feelings about Roadie would help her decide if Roadie should stay — perhaps forever — as part of their family. As soon as I connected to Tex, I felt a strong sense of what a calm, grounded, warm hearted and loving cat he was. There was a feeling of dignity — but also a fun side to him. It was also clear that Tex knew he was an extraordinarily handsome cat and he made a point of showing me how well he took care of his beautiful, long coat. Kathleen said that was Tex to a “T”! I asked Tex how he felt about Roadie. He said that Roadie could be a pest [my sense was that this meant that Roadie pestered Tex to play with him at times] but that Roadie was not a bad cat. Tex felt that Roadie had a “sweetness in his soul” and lots of love to give. Tex said that his main issue with Roadie was that Roadie had a LOT more energy and need to play than Tex did. Roadie also played rough sometimes, which Tex didn’t like. Tex showed me that he tried to be very clear with Roadie when he felt Roadie crossed the line and became too much. Tex showed me putting his foot firmly on to Roadie and holding him down as a way to say “enough!” Tex said he liked Roadie a lot — the feeling was that Tex felt like he was Roadie’s older brother. Tex said he tried very hard to show Roadie how to act “but he doesn’t seem to get it.” Tex said he especially liked Roadie when he was quiet and relaxed. He showed me snuggling with Roadie — it felt like this was a comfort to both of them. I assured Tex we’d talked to Roadie about being more gentle in his play. Kathleen confirmed what Tex had told me about his behavior with Roadie. Tex said that even though Kathleen pays attention to Roadie, Tex knows he is #1 cat with Kathleen and Roadie is #2. Tex felt that he could help guide Roadie and that he and Kathleen could help Roadie become a good, brave cat. Then it was time to talk to Roadie . . . as soon as I connected to Roadie, he said, “Am I staying here?” My feeling was that Roadie was hoping the answer would be “yes.” There was an awkward pause from Kathleen when I told her this. She said she wasn’t sure yet. She felt she might want to adopt Roadie, but she wanted didn’t want him to be unhappy. I told Roadie that he’d be staying with Kathleen and Tex for now and he seemed to be OK with that answer. Kathleen was concerned because Roadie seemed so afraid of her. Roadie said he was “afraid of all people.” He showed me that he would run from Kathleen and spent much of his time in a hiding spot in the house. It was clear to me that this was related to his past, not his present, so we next asked about what happened to Roadie before he came to APA! Roadie showed me how he got injured. He showed me being thrown against a hard surface [like a wall], impacting the hard surface with his hind quarters. He then showed me a person standing over him and, it appeared to me, that the person stepped on Roadie’s hind legs. [Animals who have been abused often show me horrible things — this made me want to throw up!] The person left Roadie there, but a kind person found him and took him to APA! I asked Roadie if he could tell me anything about his life before the accident. He didn’t show me anything specific, but my feeling was that he either hadn’t lived with people, or that he was left outside with his litter mates at a very young age. He didn’t know what happened to his litter mates or his mother. Roadie said he survived by avoiding people. It was clear to me that Roadie’s fear of people was how he protected himself when he lived outside. That fear — which kept him alive at the time — was no longer useful or appropriate behavior. Yet it persisted. Roadie was exhibiting PTSD-type behavior, which is very common in rescued animals. I told Kathleen that she needed to remember that Roadie’s fear was not personal to her. If she could remember this, be patient and encourage Roadie to be brave while “loving him through it,” Roadie could get past his fearful behavior. Kathleen said she was completely committed to helping Roadie learn to be brave again. I encouraged Kathleen to be happy and positive in all her interactions with Roadie. If she was worried or took his fear personally, Roadie would interpret those feelings as Kathleen being upset with him — he would not understand what she was really feeling. Kathleen said she understood. I asked Roadie how he felt about Kathleen. He said he liked her very much. He said he knew that she loved him and would never hurt him. But he showed me again that he often ran from her or hid. He said, “I can’t help it!” I told him that it was OK and not to worry. I asked if anything bad had happened to him since he came to Kathleen. He said, “No — she takes VERY good care of me!” Kathleen said that she had noticed that when she makes eye contact with Roadie — especially when she is standing up — he would run away. When I asked Roadie about this, he showed me that he sees eye contact as a threat. I encouraged Kathleen not to make eye contact with Roadie, except when she was sitting down, when she and Roadie were both relaxed — blinking [“cat kisses”], were a good idea! I told Roadie about the limited eye contact plan and encouraged him to be brave when he comes into rooms. He said it would help if Kathleen didn’t come toward him when he came toward her. Kathleen agreed to implement the above behavior suggestions. It was important to Kathleen to find out how Roadie felt about Tex. Roadie said he absolutely adores Tex, “He’s the best big brother ever!” He said that Tex was very smart and “knew everything!” I encouraged Roadie to follow Tex’s lead in everything — if Tex wasn’t afraid or worried, then Roadie didn’t need to be either. I encouraged Roadie to be brave and confident like Tex. Roadie said he would try. I told Roadie that Tex liked him a lot, but because Tex was older, Roadie needed to play more gently with Tex. Roadie showed me that when he gets really excited, he pounces on Tex. Roadie said he knew Tex didn’t like it, but he didn’t know what to do with his energy. I told Roadie that he could play next to Tex, play around Tex or offer to play with toys with Tex, but he need to stay OFF of Tex — all four feet on the floor. Roadie said he would try, but it felt like Roadie had a LOT of energy. I encouraged Kathleen to try playing with Roadie more, especially if she sees Roadie’s energy revving up — to try to head Roadie off before he goes after Tex. I encouraged Kathleen to try to find more active toys for Roadie, things that Roadie could use to entertain himself. I told Kathleen that she needed to remind Roadie — by talking to him and making pictures in her head —of the behavior plans we’d talked about. I told her that it was important to always tell animals what we WANT them to do — not what we DON’T want them to do. Kathleen said she would make sure to follow through with all the suggestions. Kathleen had one main question at the end of the session, “Should I get another kitten so Roadie has someone to play with?” I was still in connection with the cats when she said this and Tex immediately piped up and said, “No — we don’t need another kitten! One is enough!” After Kathleen and I stopped laughing, she agreed that one kitten was probably enough for everyone! After we finished talking to the cats, Kathleen told me that she was seriously thinking of adopting Roadie. She was concerned that he might end up with someone who wouldn’t understand him and wouldn’t work to help him with his issues as well as she could. She was afraid that, if someone adopted him but didn’t understand him, that they would give up on him and returned to the APA! — which would traumatize Roadie further. “It sounds like Tex and I are the perfect partners to help him,” Kathleen said. Kathleen said that she hoped Roadie and Tex would show her that it was right to make Roadie part of their family. Two days after our first chat, Kathleen emailed me. She reported that Roadie had already made amazing progress! He was bravely walking into rooms where she was sitting or even standing, climbing up on the couch to sit within hands reach of Kathleen and happily accepting pets — while purring like crazy! Roadie has continued to become more relaxed and is showing how happy he is to live with Kathleen and Tex. Roadie still has over exuberant moments with Tex — that is a work in progress. But when Tex is at the end of his tether, he lets Roadie know he has to stop — and Roadie listens. Kathleen said that she was concerned because Roadie was still playing rough with Tex. Tex had started giving Roadie a paw smack to tell him that Tex had enough. Tex showed me that he was not angry when he did this, it was just the best way to get the point across to Roadie. Tex showed me he walks away after the paw smack — and Roadie leaves him alone. Kathleen confirmed that was exactly what happened. Kathleen asked Tex if he wanted Roadie to live with them permanently. Tex said, “Of course! She needs to stop worrying about this. We both know he’s staying.” Kathleen laughed in surprise — but we still needed to talk to Roadie about staying. No doubt there will be things to talk to both Roadie and Tex about in the future, but the most important question has been settled. Roadie has his forever home with Tex and Kathleen! — Dressage (what people often think of as “dancing”). These three events are usually done over the course of three days. Eventing is an endurance test for both the rider and the horse, who not only have to remain strong and brave through the competition, but also accurate and skilled in all three events. Handsome was an event horse and his person was Valerie. She competed with Handsome and works professionally as a trainer and riding instructor. Valerie knew that Handsome had everything it took to be a great event horse — courage, stamina, skill and desire to compete . . . but he had one issue that she hadn’t been able to work out. When Handsome was doing cross country jumping, anything that caught his eye would cause him to spook. This can be a disastrous thing for both the horse and rider. Valerie is a very experienced rider and was able to handle Handsome’s spooks, but the problem was that Handsome would become rattled after a spook and would be difficult for Valerie to get him to refocus again. Valerie knew she and Handsome needed help with this and asked me to talk to him. I asked Handsome how he felt about his work as an event horse. He told me that he loved his work and took it very seriously. He showed me that he was very focused, especially when he was doing the cross country jumping. In fact, it was almost like he got tunnel vision — he was so focused on what was ahead of him, that things he saw out of the corner of his eye seemed to “come out of nowhere” at him. This inevitably startled him and caused him to spook. When I told Valerie this, she laughed. She said Handsome had done exactly that coming up to a jump at their last show. At the time, she didn’t understand that he was asking her a question. She thought he was going to stop in front of the jump. I asked Handsome what Valerie should do when he “sucked back”. He showed me that, if the distraction was nothing to worry about, she should tell him, “It’s OK — keep going!” I suggested that she so this out loud, as well as thinking the words and feeling the “OK” part. Valerie said she could definitely do that and would do exactly that. Valerie was also concerned because Handsome would get upset when the horse that came to the show/event with him in the trailer would leave for his/her turn to compete. When I asked Handsome about this, he said, “Sometimes they don’t come back.” I asked Valerie if Handsome had ever been at events when other horses had been injured and had not returned home. She said he had, although this had never happened to a horse Handsome trailer with. She said he had seen horses injured though, which explained why he was worried. I suggested to Handsome that the best thing he could do for his horse friend while his buddy was competing was to be calm and watch for him/her to return to the trailer. The day after our conversation, Valerie took Handsome on a challenging ride to a hiking area with plenty of distractions and limited vision ahead on the trails. Handsome had lots of opportunities to practice asking, “Is it OK? Should we go on?” Valerie did what we discussed, saying, “It’s OK! Keep going!” Handsome did just that every time. Valerie said the first time this happened was the best . . . They were trotting up a steep hill with bicycles, strollers and people on both sides at the top of the hill. That could have been a complete disaster and likely to rattle any horse. Valerie told me, “Handsome trotted boldly half way up the hill — then raised his head, sucked back and clearly asked, ‘Is it OK? Should we go on?’ I laughed out loud in surprise, told Handsome he was a good boy and “Yes, it’s OK — let’s go!” And they did! Valerie reported that Handsome had no trouble using the same technique at the next show and the “pause” when he sucked back got shorter and shorter as the communication process about the distractions improved. Also, when his trailering buddy left to compete, Handsome watched her go and stood alertly, but quietly, until she returned. “Thanks Sky — Handsome and I are getting better all the time!” — Valerie, CO. I first met Jenna, who is a pet sitter by trade, at the metaphysical fairs in Colorado. She had a client who needed to move east for health reasons and had to find homes for his beloved cats. The client rescued feral cats — some remained outdoor cats, others by choice became indoor/outdoor cats. Jenna’s client picked out a young, adorable all black cat for her. Initially Jenna was more interested in a different cat, but agreed to take the black cat. He has been a joy in her life ever since! The first issue Jenna wanted to deal with was the black cat’s name. He came with the name Blackie — but Jenna didn’t really think that was the right name for him. When I asked the cat if he liked that name, he was very clear that he did NOT. I asked him what name he would prefer . . . he showed me the feeling of “cool and dark” — like the middle of the night. I suggested Midnight, which both the cat and Jenna loved. That has been his name ever since. Another initial challenge was inappropriate scratching. As Jenna put it, “He is scratching the heck out of my couch!” When I asked Midnight about this, he showed me that he felt the couch was a special project for him — and he was very pleased about making real progress destroying it! He couldn’t understand why Jenna cared if he destroyed the couch. Remembering Midnight’s feral origin, I explained that it was a “human thing” to want to keep things in the house clean and neat. I told him that would make Jenna happy if he only used appropriate things (I showed him mental pictures of the scratching posts Jenna had) to scratch on. I told Midnight that since Jenna gave him a good home, only scratching appropriate things would be a great way to thank her for all she’d given him. Midnight agreed that he could do this for Jenna. Jenna reported that with only a few reminders, Midnight never scratched on the couch again. When Jenna started dating Brian, he didn’t have much experience with cats — he was more of a dog person. But since Jenna had cats, he was learning how to be with them. The first time I met Brian, they’d come to the fair with a problem. Brian wanted to know why Midnight had started pooping in his closet. When I asked Midnight about this, he was very clear that Brian had done something to upset him. Midnight showed me that Brian had gotten upset with him and yelled at him — although Midnight admitted that Brian only yelled at him once. I asked Brian if this was true and he confirmed it was. Brian realized immediately that this was no way to handle things and he promised never to do it again. I told Midnight that Brian was sorry and wouldn’t do that again. Midnight said, “OK” and never pooped in Brian’s closet again . . . nor did Brian ever yell at Midnight again! And then . . . there was the ceiling fan issue. Jenna had never used the ceiling fan in her living room, but one day Brian turned it on when Midnight was in the room. Midnight was clearly terrified of the fan — running away like his life depended on it — and they never turned it on again. A year or so later, they had a friend watching the cats while Jenna and Brian were traveling. They came to see me at the fair a few months later and reported that their pet sitter had told them that Midnight had not left the back of the apartment for the majority of the time they were away and had used a bath mat as a litter box. This behavior was totally abnormal for Midnight and they wanted to know what happened. Midnight showed me that there was something terrifying in the front of the apartment — something so terrifying that he didn’t even want to “look” at it so I could see it! When I told Jenna and Brian this, they knew exactly what it was — the ceiling fan in the living room, which the pet sitter had told them she’d kept on much of the time they were gone. This had become a real issues because Jenna and Brian were getting ready to move to a new place that had ceiling fans in nearly every room. They really wanted to be able to use the ceiling fans, but didn’t want Midnight to be traumatized in the process. Jenna and Brian hoped I could convince Midnight that ceiling fans were not a threat. When I asked Midnight about the ceiling fans, he showed me that he was afraid the ceiling fan was going to come off the ceiling and crush him if he stayed in the room with it. He could clearly see the slight wobble of the fixture where it connects to the ceiling (which is normal in ceiling fans). The moving blades that are normally still — then suddenly start spinning — looked to him like they would spin off or come at him. The downward force of air from the fan made him feel like it was coming down to crush him. Basically, the fan was terrifying in every way! I asked Midnight is he’d ever seen the fan leave the ceiling or the blades come off. He admitted he had not — but he kept pointing me at the wobble of the fixture. I told him that was normal and didn’t mean it would fall off the ceiling. I asked him if he thought that Jenna and Brian would use the fan if the fan was dangerous. Midnight replied, “Humans can be stupid!” Good point, right? But when I asked him if he thought that Jenna or Brian would ever intentionally put him in harms way, he agreed that they would not. I told Midnight that even though the blades of the fan moved quickly, they would never come off. Because he’d accepted the idea that the fan wouldn’t fall off the ceiling, this was an easier concept for him to accept. Finally, I showed Midnight the picture of a light switch and how a person could turn the lights on and off with the switch. He seemed to understand this concept once I explained it. He showed me that he’d seen Jenna with her hand on the light switch before the lights went out. I told him/showed him that the fan worked the same way and that it is totally under control of the humans. Once he understood, Midnight was better able to accept that ceiling fans might not be dangerous. I asked Midnight if he thought he could watch the fan from a protected place so he could see that it was safe. He showed me that there was a coffee table that he could shelter under and still see the fan. I asked Jenna and Brian if this was an accurate picture. They confirmed that there was a coffee table that Midnight could crouch under and still be able to see the fan. I suggested to Midnight that when Jenna or Brian turned the fan on next time, that he should sit under the coffee table and watch the ceiling fan. I encouraged him to be very brave and just watch the fan. I told him that he would be safe and could watch as long as he wanted until he knew it was safe. Midnight said he would try very hard to be brave. I told Jenna and Brian the plan and suggested that they be sure to tell Midnight in advance that they were going to turn on the fan (tell him verbally and “think” a picture of turning on the ceiling fan), so Midnight had time to get under the coffee table. Jenna and Brian said they would do exactly that. The next time I saw Jenna and Brian at a fair they couldn’t wait to tell me what happened with Midnight and the fan! Jenna said that when they got home, after we talked to Midnight about the fan, that she found Midnight waiting under the coffee table. It was clear that Midnight was ready to watch the fan. Jenna said she told Midnight that she was going to turn on the ceiling fan — then turned it on. Midnight stared at the fan from the safety of the coffee table for about 15 minutes, then wandered off calmly. Jenna reported that since then, Midnight has shown no concern what so ever about any ceiling fan! Jenna told me that they moved into their new place and both the cats were settled and happy. Midnight continues to be unconcerned about the ceiling fans in the new place and Jenna and Brian are happy to be able to finally use the fans! “We always say how lucky we are to have the best cat. He is just so ‘cool’, like The Fonz! He has a fantastic personality and disposition. Yet without Sky’s help, he could have had SO many irritating cat habits. Thanks to Sky’s conversations with Midnight, we have such a happy cat home!” — Jenna J., CO.
Everyone who has cats that spend time outside knows that there are risks involved with letting them be outside. Cars, other cats, dogs, small predators — even humans — can pose a danger to cats. But for people who live in the mountains in the USA, the dangers are greater and the predators bigger. Most cats become savvy and expert at avoiding danger . . . but their people always worry, even though they know it’s their cat’s choice to run the risk. I spoke with Nancy about her cat Oscar at a fair in Colorado. Nancy said she’d always had indoor cats, due to the dangers outside in Colorado. But things changed when her cat Oscar entered her life. Oscar made it clear to Nancy that he wanted to spend time outside. Nancy didn’t want to stifle Oscar or make him unhappy, so she started letting him go outside — but only under her strict supervision. Oscar was allowed to go out on the patio and run around in the fenced back yard but only when Nancy was watching him. Oscar loved his new freedom and enjoyed every minute of outdoor play and looked forward to each chance to get outdoors. Then Nancy moved to a new house closer to the mountains in Colorado. In the new house, Oscar discovered the dog door and began to let himself out into the yard. Oscar was totally loving the new freedom he had — but Nancy was worried. The new yard was fenced, but backed up to a hiking trail and Nancy had seen fox, bear, coyotes and even mountain lions in the trail area. Any of these could make a meal of Oscar. Nancy told me she had seen Oscar go over the fence in the backyard, into the trail area. I asked Oscar about this. He admitted to going over the fence, but only once. In fact, he showed me that he spent most of his time sitting on the roof of the shed near the fence, watching the trail activity. Nancy confirmed that Oscar had spent a lot of time on the shed roof, watching the woods and trail. She also said that she’d only found Oscar missing on one occasion. But she was very worried that if Oscar didn’t stay in the yard, he would be killed by predators. I explained to Oscar that it was very important to stay in the yard. I told him that there were big animals (I showed him images of foxes, coyotes, bear and mountain lions) that would end his life and cause him to go to Spirit. I told him that Nancy was very worried about him and didn’t want this to happen — so it was very, very important that he stayed in the yard. Oscar told me he understood the dangers. He said, “I’ve seen some really bad things happen out there to other animals.” The images Oscar showed me were of predators killing and eating other animals. He’d seen this the day he was missing from the yard and he’d seen it again from the roof of the shed on another occasion. He was shocked and clearly scared by what he’d seen. Oscar told me that because of what he’d seen, he was never going to leave the yard again. Oscar knew it wasn’t safe outside the fence. He told me he knew he was safe inside the yard because Nancy’s three dogs would protect him. Nancy said that Oscar was welcome to use the dog door to go out whenever he wanted to, but he needed to stay in the fenced yard. She said it was OK for Oscar to go on the shed roof if he wanted to. I told Oscar this and while he was more than happy to agree to stay in the yard, he said he didn’t think he’d spend much time on the shed roof any more — not after what he’d seen. I heard from Nancy a year or so later. She reported that Oscar continues to keep his promise to stay in the yard and hasn’t been sitting on the roof of the shed. Nancy said Oscar is happy to watch the birds, scout for mice and look through the fence into the neighbor’s yard. “I am so relieved that Oscar has kept his promise and stays in the yard. Hearing Oscar’s promise directly – through Sky, along with his behavior verifying this, is such a relief to me. I want Oscar to be happy and free but not at the expense of his safety. Thanks, Sky for helping protect my loved ones!” — Nancy J., CO.
KitKat and Shadow: Kids Aren’t Always Easy to Live With! No cat could have been prouder of her kittens that KitKat and she was a wonderful mother. The kittens were so adorable that Julie had no problems finding homes for them as soon as they were old enough to be adopted. Julie thought that it would be nice for KitKat to have one of her kittens stay with her so KitKat had a companion to play with, so she kept one of the kittens — a black and white kitten that Julie named Shadow. Good intentions do sometimes back fire! Julie contacted me in early September 2016 and asked me to see if I could figure out what was going on between KitKat and Shadow. KitKat would hiss and growl at Shadow whenever he came near her. To Julie, Shadow seemed quiet and gentle. Julie just wanted them both to get along and couldn’t understand how KitKat could behave this way toward her own kitten. I felt that there was more going on than just KitKat not wanting Shadow around. I asked KitKat how she felt about her other kittens going to new homes. KitKat was very clear that, to her, it was the natural order of things — a cat has kittens, they are weaned and then the kittens are on their own. KitKat felt she should be able to go back to her own life, without kittens. But that didn’t happen because Shadow was still there. KitKat’s solution to this was to spend as much time as possible outside away from Shadow. She showed me that she would make a loop through the neighborhood when she was out. If Shadow was being particularly annoying, she would make an even longer loop. But she always came home at night and Julie was grateful for that. When KitKat was in the house, she was very tense — always waiting for Shadow to pounce on her, which he did all the time. KitKat couldn’t wait to get outside every day. Julie asked me to tell KitKat that she was concerned that KitKat wouldn’t come back one day. KitKat said, “This is my home, where else would I go?” That helped Julie feel better about KitKat being gone all day. All of this discord made Julie very sad. She just couldn’t understand KitKat’s attitude toward Shadow. I knew we had more to figure out. Julie wanted me to ask KitKat if there was another reason that she didn’t want to be around Shadow. KitKat immediately said she thought that Shadow was “stupid.” When I told Julie that, we both started to laugh — it seemed like such an unlikely thing for a cat to say. Julie admitted that she’d gotten the feeling that this was the case. I asked why KitKat she felt Shadow was “stupid”. KitKat showed me that, unlike herself, Shadow was “not brave” when he was outside and stayed close to the house. Julie confirmed that this was true. I asked Julie if there were any “smart” things that Shadow did outside. Julie told me that Shadow sometimes climbed the tree in the yard and had figured out how to get up on the porch roof — which KitKat never did. KitKat smugly pointed out that Shadow only climbed the tree because he copied her and very grudgingly admitted that climbing on the roof was clever. KitKat said that Shadow “wasn’t smart about being outside” and she didn’t want to have to be responsible for him. We assured KitKat that she did not need to feel responsible for Shadow inside or outside — that was Julie’s job now. That took the pressure off of KitKat and made her feel better. I felt that we had a good understanding of what was going on from KitKat’s perspective, so it was time to talk to Shadow. I told KitKat we would do that next and she told me to tell Shadow to “back off!” I assured her we would do our best to help Shadow understand. I told KitKat that she needed to give Shadow a chance and to try not to be so reactive to Shadow — to ignore him as much as possible and avoid him when she was in the house. KitKat said, “I’m not the problem — he is!” But she said she would try, even though it would be hard to ignore him. Julie wanted to make sure that Shadow understood how important it was for him to leave KitKat alone. Julie asked me to tell him (and she meant it) that if he and KitKat couldn’t get along, she would have to find a new home for Shadow because KitKat was there first. Shadow responded by saying, “Oh no! I like it here. I don’t want to go anywhere else!” He said he felt special because he was the only kitten that got to stay. He said he just wanted to play with KitKat, but he would try to remember to come to a person if he wanted play or get extra attention. He said it wouldn’t be as much fun as playing with KitKat, but he would really try. We asked Shadow how he felt about going outside. Julie wanted to know why he stayed by the house, rather than roaming more. Shadow showed me being chased up a tree by a dog when he first started going outside. He said it really scared him and he thought he was going to “be up in the tree forever,” but he finally felt safe enough to come down. He said he never wanted that to happen again. He thought the outside was “a very big place” and it was safer to stay close to the house and only be out for short periods. Julie confirmed that Shadow only went out for an hour or so at a time. I asked Shadow what he thought of KitKat being out all day. He said she was “very brave” and he felt she moved through the yard “like a wild cat” — he was a bit in awe of that! I heard from Julie again late in September. She reported that Shadow was doing a great job and was backing down when KitKat warned him to stay away. As a result, KitKat no longer had to be so “loud” about telling Shadow to move away. Peace was restored and KitKat was able to relax. But an occasional issue had gotten worse — Shadow was peeing outside the litter box — not all the time, but way too often. When I asked Shadow about this, he said he, “didn’t mean to pee everywhere, but I just HAVE to go!” Shadow didn’t show me that he had pain typical of a UTI or bladder issue, but he did say that he thought his urine had a strong smell. UTI’s can have subtle symptoms in cats and I was concerned that Shadow might have a UTI. I told Julie that I would encourage Shadow to use the litter box, but if he continued to pee outside the litter box, she should have Shadow checked by the vet. Julie agreed to follow up with the vet if needed. I showed Shadow that it was very important that as soon as he felt he needed to pee, he needed to run for the litter box and pee in the box. We went over this several times and Shadow was able to show me what he needed to do and said he would do his best to try, since it was upsetting Julie so much. A week or two later, Julie reported that a couple days after the chat with Shadow, she and Shadow were in the garage and Shadow suddenly dashed for the house at a full run. Julie was afraid he’d gotten startled by something and went to look for Shadow. To her delight, Julie found Shadow in the litter box peeing! Clearly, he followed the directions to the letter and there were no more incidents of peeing outside the litter box. I heard from Julie again in November. Shadow was now a big boy and starting to really throw his weight around — much to KitKat’s distress. KitKat was still spending most of the day outside, but Shadow knew just when KitKat normally came in and would wait for her in the hallway, ready to pounce on her. When I asked KitKat about this, she was beyond frustrated. To her, Shadow was just being a bully. Coming into the house, which should have been a relaxing time for KitKat, had become a tense and unhappy time. I assured her we’d talk to Shadow about this. I asked her if it would work for her if we told Shadow not to wait in the hallway, so KitKat could come in safely. She agreed that would work for her. KitKat felt they were getting along OK otherwise. I asked Shadow about lying in wait for KitKat to come in. Shadow was delighted about this new game! As before, he had no intention at all of hurting KitKat and just wanted to play “pounce”. I explained to Shadow that he very much outweighed KitKat and that she was not enjoying the game at all. As before, Shadow didn’t understand KitKat’s reluctance to play. I told Shadow that it would be best if he stayed out of the hallway during the time when KitKat normally came in. I showed him that he could go to any other room in the house at that time, but not the hallway. I reminded him again that playing with his toys, going outside, running in the house and playing with his people were all great ways to play. Shadow agreed to the plan and was able to show me what we requested he do . . . but he still wanted to interact with KitKat. I suggested that it would be OK for Shadow to sit or lie down near KitKat and just be quiet with her. I reminded him that when he wanted to be active, he should play with his toys, run in the house, go outside or play with his people. Shadow said, “I’m not that good at being quiet, but I’ll try.” I also encouraged Julie to play with Shadow more often so he could get rid of some energy. Julie agreed to do that and said she would keep reminding Shadow of the plan. I heard from Julie again in January 2017. This time it was good news! Peace had been restored between Shadow and KitKat! Because Shadow had learned to be “quiet,” he and KitKat had become close friends and could lie quietly — and happily — next to each other, as in the photo above. Julie was thrilled that beautiful momma KitKat and her adorable son, Shadow, could be happy together in their forever home. Finally, everyone was happy! “I am so grateful for our sessions with Sky because we couldn’t have worked out the difficulties without communication through her. You are our saving grace, Sky!” — Julie E., CO. The first time I spoke to Nancy was at a metaphysical fair in Colorado. She told me that she had two dogs who’d recently crossed to Spirit — Sophie, a chow mix and Buster, a pit bull. Nancy had adopted the dogs within days of each other. She missed both dogs very much. Nancy said she was at ease about why Buster needed to cross to Spirit — he was very arthritic and weak. But she had questions for Sophie. Nancy didn’t tell me anything more at that point, so I connected to Sophie. As soon as I connected to Sophie, I could feel what a strong, determined and very “in control” spirit she had. The first thing Sophie said was that everything was all right now — she was fine. Sophie showed herself to me as healthy and strong. It was clear to me that it was very important to Sophie that Nancy know this. Sophie also showed me that she was with another dog who was shorter than Sophie — I had no doubt that this was Buster. Buster looked happy, contented and perfect. Nancy explained that she had helped Buster and Sophie cross to Spirit on the same day. Nancy was greatly relieved — but not surprised — to find that they were together in Spirit. Nancy told me she really needed to understand what happened with Sophie. When I asked Sophie to show me what happened to her at the end of her life, she showed me being perfectly healthy — until just a few days before she crossed over. She showed me her nose and throat feeling congested and full of fluid. She also showed me pressure in her chest, but I couldn’t tell what was causing it. When I told Nancy this, she said it made sense. Nancy reported that she had woken up one morning to find Sophie bleeding from her nose. Nancy rushed Sophie to the vet and the bleeding stopped. Tests showed that Sophie had an inoperable, fatal tumor behind her heart. Nancy was devastated — Sophie had always been so healthy! Nancy had been planning to help Buster cross to Spirit soon, but had assumed she’d have Sophie with her for many years. Obviously, with the inoperable tumor and threat of bleeding (which never recurred), Sophie would need to cross to Spirit very soon. Nancy brought Sophie home and a few days later, helped Sophie and Buster cross to Spirit together. What Nancy didn’t understand was where the tumor came from, since Sophie had always been healthy and had no symptoms prior to the nose bleed. Her confusion about what happened made her grief over loosing both dogs even worse. She desperately hoped that Sophie could explain what happened. Like our Guides and Angels, animals and people in Spirit see things from a different perspective. I think of it as “seeing the big picture” — being able to understand the reasons for things that happen and choices our soul consciousness makes that we might not be able to see clearly when we are alive. Because Sophie was now in Spirit, she was able to explain what happened. Sophie told us that Buster told her that he would need to cross to Spirit soon. His body was failing and he knew that Nancy would help him cross to Spirit — but he was afraid to cross over alone. Sophie showed me that she and Buster had been inseparable since they’d been with Nancy — they loved each other and were bonded, like brother and sister. Sophie showed me that she was always the leader and Buster always followed her happily. Sophie knew that she couldn’t let Buster be alone and afraid when he crossed to Spirit, so she decided she would go with him. Sophie knew that she needed to make sure there would be no doubt in Nancy’s mind that Sophie needed to cross over with Buster — no question of whether she needed to cross over or not — so she created the tumor in her chest. Sophie said that she knew that Nancy would be OK after they crossed. She knew that Nancy would be sad, but she would be all right. Sophie didn’t think Buster could manage without her, so she chose to stay with Buster. When I told Nancy this, she was shocked — but she agreed that it made perfect sense. Sophie always looked out for Buster and it only made sense to Nancy that she would continue to do so, even in Spirit. Sophie was a dog who knew her own mind and always followed her own plan in life — no surprise that she would do the same in death. Nancy said that Sophie had read her right as well. Sad as Nancy was to loose both dogs at the same time, she knew in her heart that Buster needed Sophie more than Nancy did and she was very happy that they were together in Spirit. Nancy told me later that she knows this is true because recently both dogs played a joke on her . . . a friend of Nancy’s got a new dog and named her Sophie and her nephew got a cat and named him Buster! Nancy knew that her Sophie and Buster were responsible for the name choices and it made her laugh with joy! “Having Sky get this explanation from Sophie was a great relief to me. I had counted on Sophie being there to help me get over letting of Buster. The shock of an inoperable tumor behind Sophie’s heart was more than I could fathom. Talking to Sophie and Buster was such a relief to me. I am so happy that they are together and their loss is more manageable now that I know it was Sophie’s decision to stay with her best friend. I am so proud of Sophie!” — Nancy J., CO.